Punkture Wounds Productions’ play Quantum Taxis is one of the Toronto Fringe Festival’s site-specific productions and takes place in the parking garage under Honest Ed’s. The set consists of a big ol’ yellow taxi. 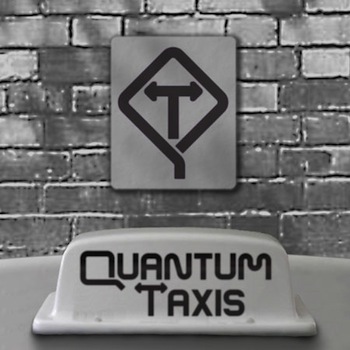 The play follows two cabbies (Steve Hetherington and Romaine Waite) and two passengers (Herpreet Minhas and Laurel Morgan) and switches back and fourth between two alternate realities where each passenger gets into a different taxi and their interactions with the different drivers significantly alters the course of their lives. The play is a fascinating take on chaos theory‘s butterfly effect where a small, seemingly insignificant variation in an action can cascade to create a much larger unforeseen result. In this case, the seemingly inconsequential tip of a sign on a post right or left creates hugely divergent outcomes. Paul Steinsland’s script is also an exploration of free will vs. determinism with one cabbie, an ultra-logical former physicist representing the chaotic universe of free will and the other cabbie, a fatalistic, happy-go-lucky reggae musician convinced that everything in life is destined to happen, representing the deterministic universe. The two passengers each find themselves at important junctions in their lives; one, a huffy businesswoman, is considering leaving her controlling boyfriend, the other, a youth social worker, is contemplating a new, higher-paying office job. As the passengers interact with the cabbies they wax philosophically on topics such as karma and along the way, reveal intricate details of their personal lives, and discuss heavy personal issues such as loss, grief, forgiveness and redemption. Overall, I found the script fascinating and found myself really actively thinking about the questions it asks. This is definitely the type of show where you have to really listen to process the ideas in the script. However, at 80 minutes I thought the show was a little longer than it needed to be and would probably have had a bit more impact if some of the longer scenes were edited down. That may be so but I thought the script was smart and interesting and the concept was very well-executed.